Many important and influential companies and individuals in the transport ticketing sector gathered at the Business Design Centre in London for the Transport Ticketing 2014 Conference and Expo. This was co-located with Passenger Information 2014, both providing in depth presentations and debates on the latest technology in these areas and best practice in implementing them. The event also had an exhibition featuring a variety of businesses involved in ticketing and passenger information. One of the main events of the first day was a panel debate entitled ‘Where will the future of transport ticketing take the industry: smartcard, mobile or bank card ticketing?’ Chairing the debate was CEO of Masabi, Ben Whitaker. Ben gave some background into the nature of passengers, dividing them into ‘Spocks’ and ‘Homers’; the former planning and researching their journey ahead and in many cases paying for tickets in advance, whilst the latter turns up on the day of travel with no idea of what fare is best for them. Taking into account the fact that various payment and ticketing methods are emerging of late, such as smartcards and mobile ticketing, he then went on to ask whether we can have a single technology for ticketing in the future? Responding to the challenge, Head of Smart and Integrated Ticketing at the DfT, Jenni Borg, said the evidence she is aware of points towards there being no one technology to rule them all in terms of transport ticketing. She believes it will be a hybrid model, with various payment and ticketing options. She added that different payment options suited different passengers with their own preferences. She has noticed the increasing usage of card payments, a development also taking place in the ‘adjacent retail markets’, but even though these and contactless payments are making in-roads, she believes people still like using cash. Similarly, Guliz Ozturk, International Marketing Manager at Turkish ticket system company Kentkart, believes there is no single ticketing method fast emerging to dominate the industry at the moment. The choice of what payment method is used depends on the city and the country. However, she claims having a single system is beneficial, giving the example of the one Kentkart rolled out in its home country that sees up to 30,000 subscribers use smartcards to pay for travel in multiple cities and operators, especially when it comes to addressing the issue of interoperability. She claims that it is not only business model challenges but legislation issues that hold back more systems such as these from being rolled out. Business Development Manager at Infineon Technologies UK, Chris Shire, highlighted that in some countries where there is one train operator, rolling out a single ticketing system is straightforward. In countries with multiple operators, he claims it is not so easy. He thinks it is possible for a hybrid system that is fully joined up to be introduced, something he believes would benefit passengers in terms of it also enabling the provision of good real time information from across the network. However, with the complex nature of business roles, he does not believe the relationship and co-operation between operators required for this will happen soon. He said a more unified solution for ticketing across the transport network would keep both the ‘Spocks’ and ‘Homers’ happy. NFC (near field communication) is a technology buzz word in the world of ticketing at the moment, enabling smartphones and other mobile devices to establish radio communication with other equipment, such as ticket machines. 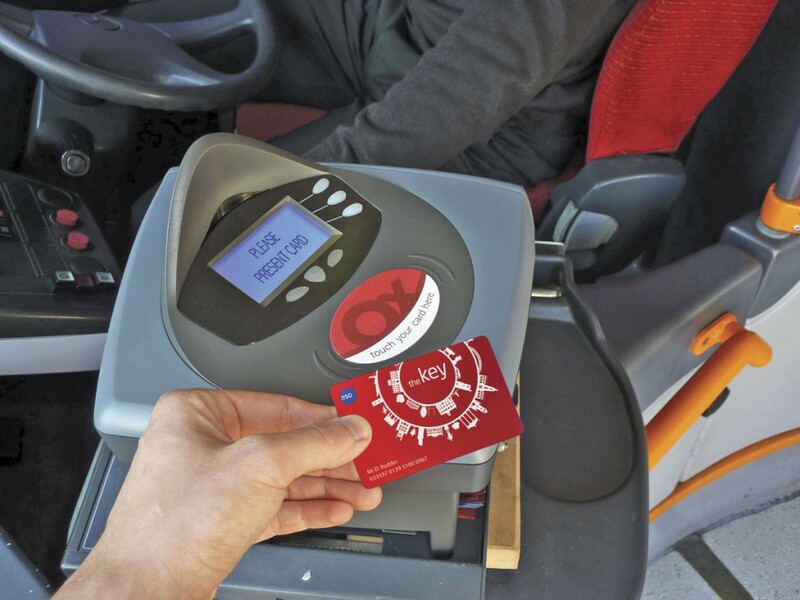 There are systems being developed to enable passengers to pay for transport using NFC, the aim being to speed up and make buying tickets easier. It is an area being strongly researched by Kentkart, according to Guliz, claiming that ‘it is possible and is a feature all of us could be using’. Jenni from DfT said research has indicated smartphones will have a big role in the future of ticketing. She believes the public ‘want their phone to do something’, but what this is has not been fully decided. The next speaker was Nicolas Mackie, Senior Manager at Visa payWave Product Management, Visa Europe. Nic’s presentation, ‘The future of transport ticketing has arrived’, focused on the latest technology available from the electronic payment specialist, in particular its capabilities in rolling out contactless mobile phone payment systems. London Buses already accept Visa contactless payments, as do a number of other retail outlets, making it part of a larger ‘economic ecosystem’. It seems ‘passengers are voting with their cards’, with almost 1m Visa transactions made per month on TfL’s network. Nic said, ‘The growth is phenomenal’. A strong focus on contactless payments is part of Visa’s way of being ‘part of the tidal wave, rather than what it hits’. It is aiming to do this with its payWave contactless payment technology. It has three separate means of doing this; firstly through cards, then memory tags and finally via mobile phones. He claimed there are advantages in introducing this technology for the passenger and operator, all of which are underpinned by the principle of simplification. At the moment, the surge towards smart travel sees data stored on cards, but with the mobile system from Visa, the information on digital wallets is stored via cloud. This, according to Nic, is about creating something that ‘leap frogs’ all other EMV (Europay MasterCard and Visa) solutions on the market, it is not just a ‘me too’ technology. Nic said Visa payWave offers a flexible suite of products that can be ‘employed by anyone, large or small. Interest in it has been palpable and we are happy to take that on and go forward’. The benefits are a faster and easier to use ticketing system. An interesting question posed to Nic was how Visa would deal with ticketing for children who generally don’t have EMV cards. One solution would be to issue contactless micro-tags that are fully compliant with the rest of the system. Giving an insight into what modern operators seek in a ticketing system, Trailways of New York Marketing Manager Alexander Berardi announced the company was seeking a new platform for selling tickets at the conference. The operator is New York State’s largest provider of intercity bus travel, carrying up to 10m passengers annually and currently uses two models, TRIPS and Gateway. The former was developed by Greyhound, whilst the latter was created by Gateway Ticketing Systems in conjunction with North American intercity bus companies. The operator is now looking to develop a more advanced system, able to deal with the changing industry. One problem is that Gateway has Greyhound schedules configured into it, with the FirstGroup owned company accepting tickets issued by Trailways online. These schedules may change frequently and the consequence of any inaccurate timetable information can mean leaving customers stranded when they miss a connection the system suggests but does not actually exist. Another issue is the fact it costs a lot to supply the equipment and support services for third party agencies who sell the company’s tickets. In a new system, Trailways is looking for something that will contain its own schedules and those of other carriers, as well as running its terminal sales, its new webstore and interfacing with other ticketing systems. It must have options for capacity management, be able to produce customised data reports, have interfaces for both store terminal POS and webstore sales and be able to produce customisable graphics on tickets. It also seeks a solution that will allow the ability for add on features such as priority boarding or extra baggage charges, be available with a multi-language display, provide paperless boarding options and feature more safeguards against fraud. There was a host of other interesting presentations and discussions to attend over the two days but, with the Passenger Information talks being held at the same time as the Ticketing ones, I could not attend them all. Others likely to have been of particular interest were: ‘Development of ticketing technology: the operators point of view’ by Martyn Lewis, Stagecoach Marketing and Commercial Manager; ‘The importance of accessible travel information: the perspective of passengers with hearing loss’, by CEO of ‘Action on Hearing Loss’, Paul Breckell; and ‘Delivering effective communication in times of service disruption’, by NCT MD Mark Fowles.